Got no time for downtime? Bring your containers to our team for fast repairs. Western Containers knows that when your container is in our yard, it’s not earning its keep. That’s why we place a special emphasis on completing precision repairs fast..
Our Sydney depot combines highly-skilled repair crews, on-site aluminium and stainless steel welders, 50 covered and uncovered repair bays, plus a huge inventory of parts to complete all kinds of structural, mechanical or electrical repairs in record-breaking time. While other yards can take up to 2-3 weeks for routine repair work, Western Containers can usually complete the same job in 1-3 days. 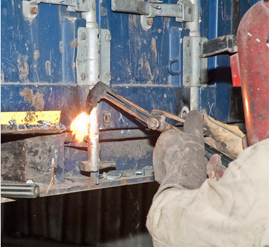 In addition to high-quality general repair work, Western Containers is the go-to specialist for the quick and cost-effective repair of tautliners, refrigerated containers, and other specialised equipment. Bring your containers to Western Containers.